October began sedately, with relatively few birds banded. Since the bulk of the warbler migration has already passed through Pelee Island, we entered a fallow period as we waited for the sparrows and kinglets to arrive. These groups (along with Hermit Thrushes, which are the last of the Catharus thrush species to migrate) generally make up the majority of PIBO’s banding and observation totals in mid-to-late fall. The temperatures were warm and the winds were mostly from the south, retarding migration. While large numbers of birds were seen, especially of Blue Jays and blackbirds, very few birds were captured. This began to change on October 8th, when the first large flocks of kinglets arrived at the end of what was otherwise a quiet morning. In the end, out of 25 birds banded, thirteen were Golden-crowned Kinglets. North winds began overnight and continued into the next morning, when Golden-crowned Kinglets again made up the bulk of the birds banded and observed. The morning was not as busy as expected, considering the favourable winds, but some of the thrushes that were captured were carrying large amounts of fat, indicating that they were prepared to begin a long flight. The winds was from the north again on October 10th – and 164 birds were banded, our highest daily banding total this year! Fifty of them were Golden-crowned Kinglets, followed by 34 White-throated Sparrows and 25 Hermit Thrushes. It was a very busy morning, but with the assistance of PIBO’s Science Officer Pat Kramer, all the birds were extracted, banded and released safely. It rained on October 11th, granting us some time to recover, and then the excitement continued on October 12th, when we banded 160 birds despite a late start due to inclement weather. 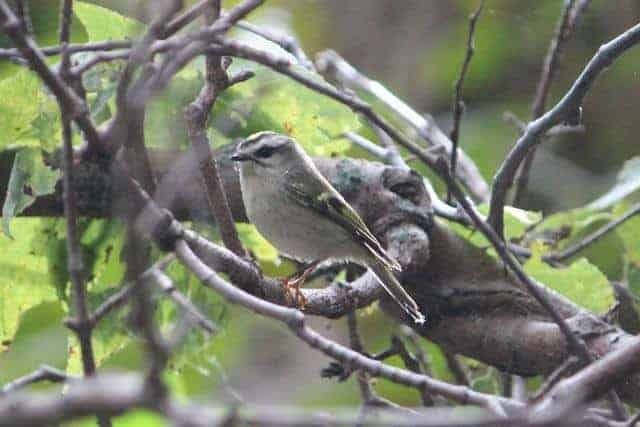 Once again, the most numerous species was the Golden-crowned Kinglet, followed this time by Ruby-crowned Kinglets, and White-throated Sparrows. The following day was Friday, October 13th, and true to its nature, it was a trying day – 147 birds were banded, most of them after 11 a.m., and owing to a temporary staffing shortage some nets had to be closed early so that we weren’t overwhelmed. Still, it was a successful morning, with 58 Golden-crowned Kinglets banded in total. October 14th was much quieter, with a more reasonable 37 birds banded and fewer kinglets and thrushes in the area. Many White-throated Sparrows were seen, but only two were captured. Nets were not opened on October 15th due to gale-force winds and scattered showers. Large flocks of migrating Blue Jays were common in the first week of October, with many hundreds being counted on census and in the netting area. There was a constant stream of them moving down Fish Point and out over the lake on October 2nd, in flocks of twenty to fifty birds. Six of them were captured first thing in the morning on October 10th, and did their best to extract their pound of flesh using their sharp claws and powerful beaks before being banded and released. After that ordeal, it was a relief when it began to rain and nets could be closed for the morning! Blackbird species have also been seen in large numbers, in mixed flocks of Red-winged Blackbirds, Common Grackles, and Brown-headed Cowbirds. A very large flock of two hundred European Starlings was seen on census on October 6th, generating an impressive amount of noise as they flew overhead. The warm temperatures and unsettled weather seem to have delayed migration for some birds, and have brought us a few surprises in the shapes of warbler species who would normally be well on their way south by now. Black-throated Blue Warblers have been the most consistent, with one or two being seen every morning, but Black-throated Green Warblers have also been observed, and an American Redstart was banded as late as October 12th! A Northern Parula was seen on October 2nd and one was captured on October 10th. At this time of year, the dominant warbler species are Myrtle Warblers and Western Palm Warblers, and they began to be seen and captured more frequently from October 6th onwards. Overall, diversity has been higher than usual for this late in the fall. The total number of species seen each day has generally been between forty and fifty species, and reached a high of 63 on October 10th. A few Sharp-shinned Hawks have been captured in the netting area, but fewer of them have been banded than in previous years. Four were seen in and around the banding station on October 14th though, so they are still moving through the area. A Peregrine Falcon bearing a leg band was seen on census on October 7th, but as it did not condescend to come into the netting area to be captured its origins remain a mystery. Also on October 7th, a Merlin stopped by and perched above the banding station to eat its lunch of a plucked Blue Jay, which was identifiable only by a few tail feathers. PIBO’s first public owling night will take place this Saturday, October 21st, from 7:30 p.m. onwards. Please join us at the PIBO cottage (585 South Shore Road) for mulled wine and hot apple cider, and possibly a chance to see one of North America’s smallest species of owl, the Northern Saw-whet. Unfortunately, the warm temperatures we have been enjoying recently are not ideal for Saw-whet owls, who prefer it to be a bit chillier before they begin migrating, but we will open our owling nets regardless. If the night turns out to be raining, nets will be opened on October 22nd instead. The PIBO banding station at Fish Point is open from approximately 7 a.m. to 1 p.m., seven days a week (weather permitting). Visitors are always welcome, and we hope to see you there!